GREAT MILES 728! Oxford White exterior and Ebony Black interior. Third Row Seat, Back-Up Camera, Onboard Communications System, Flex Fuel, Rear Air, EQUIPMENT GROUP 201A, EBONY BLACK, UNIQUE CLOTH BUCKET SEAT... Aluminum Wheels CLICK ME! Third Row Seat, Rear Air, Back-Up Camera, Flex Fuel, Onboard Communications System, Aluminum Wheels. Rear Spoiler, Keyless Entry, Privacy Glass, Child Safety Locks, Steering Wheel Controls. EQUIPMENT GROUP 201A LED Fog Lamps, Power Liftgate, Power & Heated Glass Sideview Mirrors, manual-folding, LED turn signal indicators, security approach lamps, integrated blind spot mirrors and gloss shadow black caps, Note: Integrated blind spot mirrors not included when equipped w/BLIS, Driver Connect Package, Auto-Dimming Rearview Mirror, SYNC Connect, remotely start, lock and unlock vehicle (includes service for 5 years from the vehicle sale date as recorded by the dealer), schedule specific times to remotely start vehicle, locate parked vehicle, check vehicle status (includes service for 5 years from the vehicle sale date as recorded by the dealer) and Wi-Fi hotspot connects up to 10 devices (includes a trial subscription of 3 months or 3 gigabytes, whichever comes first, Wireless, EBONY BLACK, UNIQUE CLOTH BUCKET SEATS 10-way power driver`s seat w/power lumbar and recline. 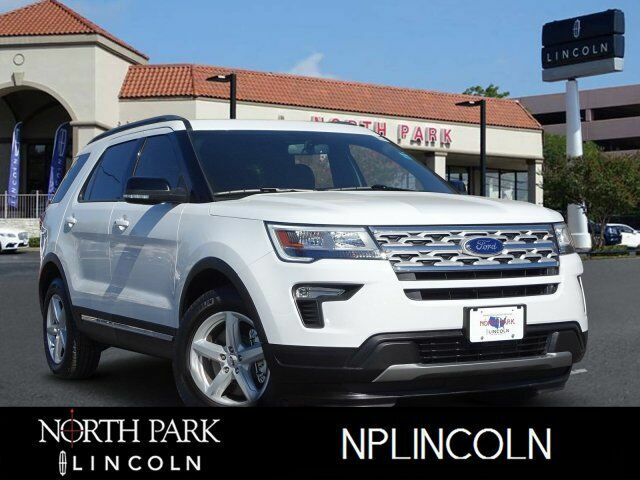 2018 Ford Explorer with Oxford White exterior and Ebony Black interior features a V6 Cylinder Engine with 290 HP at 6500 RPM*. CARFAX 1-Owner Well-tuned electric steering system and natural assist level; it turns in with immediacy. Good heft at speed but light enough for parking-lot duty. -Edmunds.com.